The HACU office in Washington, DC will be closed on Monday, January 14, 2019, due to inclement weather. 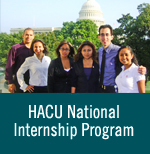 HACU National Internship Program: Students serving internships located in the Washington, D.C. The Office of Personnel Management (OPM) updated the status page. The federal offices in the DC area are closed Monday, January 14, 2019. You may want to email your supervisor in the event they have specific instructions to your internship site. Please do not hesitate to contact us if you have any questions or concerns at hnip@hacu.net.